Baby, it’s cold outside. And when it’s cold outside, one thing that will always warm you up is a hot bowl of chili, especially when it has a kick! 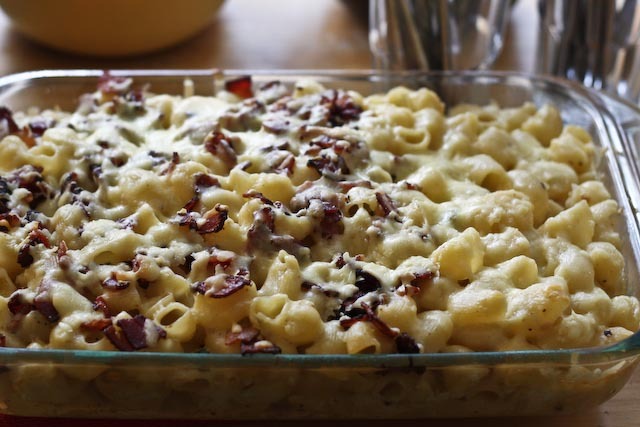 This recipe from Slim’s Last Chance in Seattle was featured on an episode of Diners, Drive-Ins and Dives, and I just had to try it. And man, oh, man, it’s just as delicious as it looked. 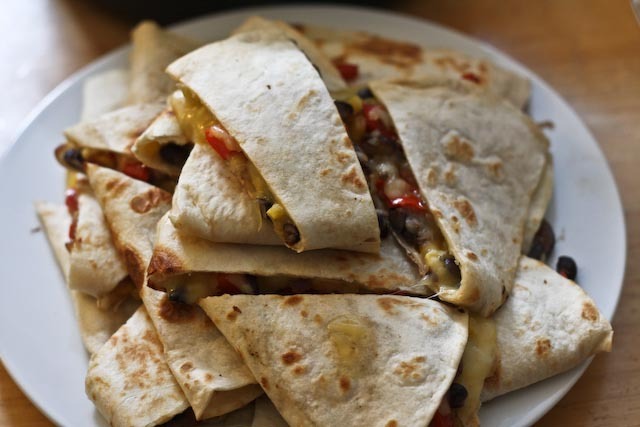 This recipe uses A LOT of peppers. Slim’s Last Chance uses anaheim peppers and a few serrano peppers in addition to jalapeños, but I had a hard time finding such a wide variety of peppers, and decided to substitute the anaheims with poblanos and to use a few more jalapeños instead of adding serranos as well. 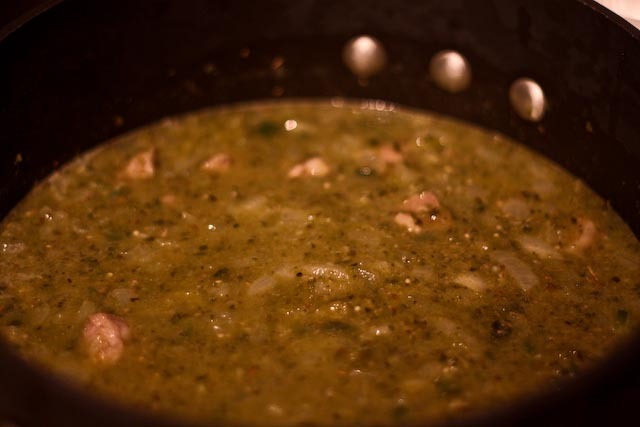 I think the poblanos actually gave this chili an even bigger kick – so beware! 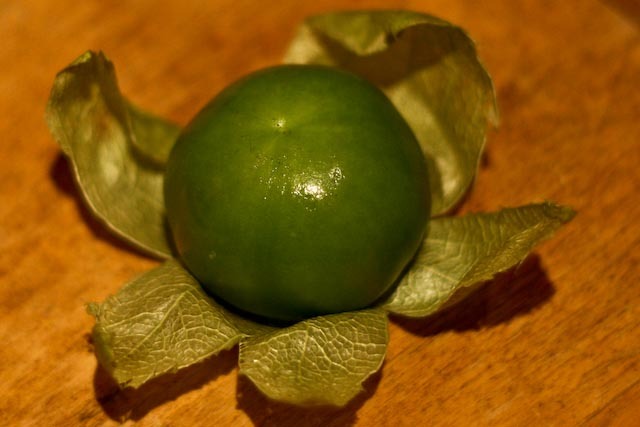 Mmm…tomatillos. 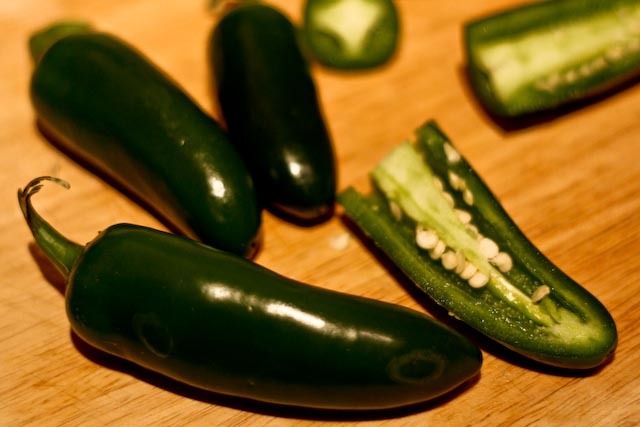 These little gems bring a lot of hearty flavor to the chili. I removed almost all of the seeds of the jalapeños and poblanos, and this chili was STILL pretty spicy. Also, as a word of caution, make sure you wash your hands well after handling these puppies! 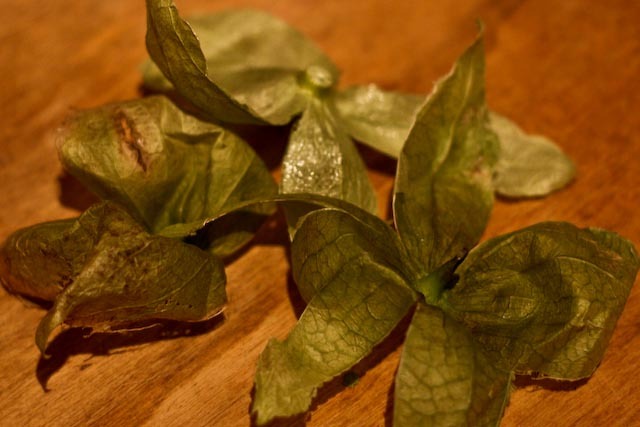 So many seeds – good thing I left these out! 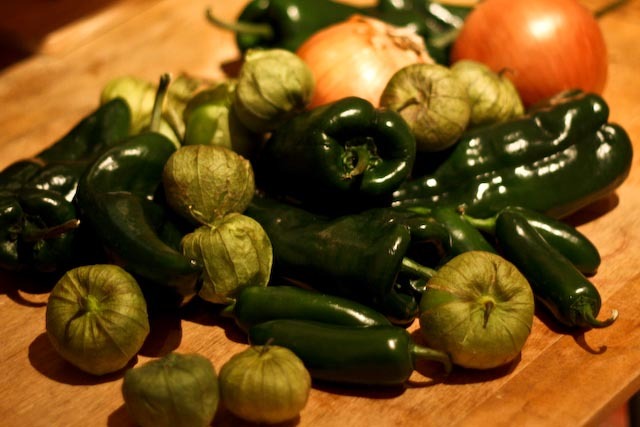 Roasting the tomatillos and peppers beforehand adds a little extra flavor and makes it easier to meld the flavors together. I pureed the poblanos and tomatillos in a food processor before adding to the chili. Slim’s Last Chance uses a gigantic hunk of pork shoulder for their recipe. I decided to go with just two pounds of pork shoulder (as opposed to five), and I think it worked out quite well. If you’d like your chili even meatier, by all means go big on the pork! I sauteed garlic, onion and jalapeños in a saute pan and cooked the pork in a large pot before mixing everything together. Lots of spices give this chili tons of great flavors. 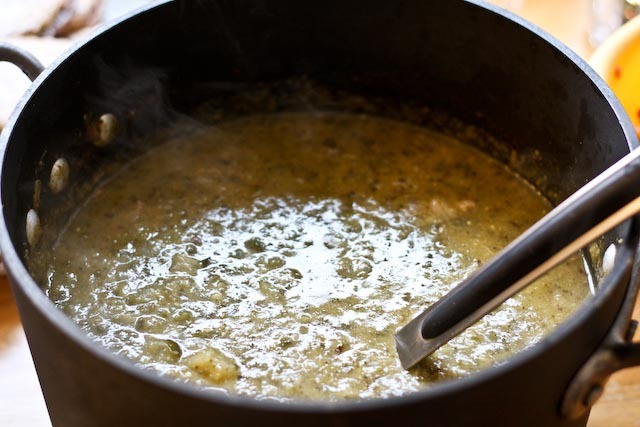 Everything mixed together with chicken broth and a corn flour roux to add extra flavor and thickness. Because my chili was super spicy, I actually added 2x the roux to reduce the chili’s punch. 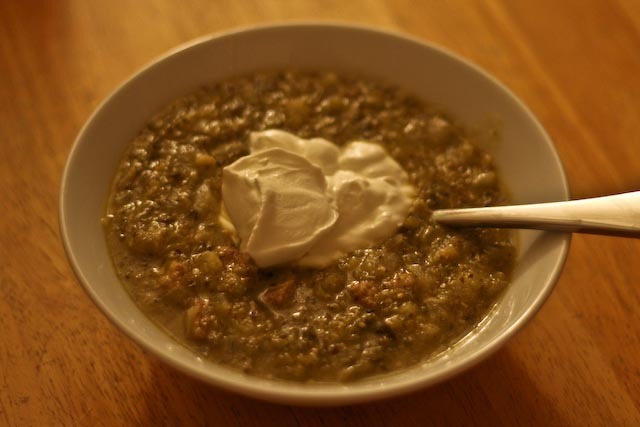 Topped off with a heaping spoonful of (light) sour cream! I served the chili as part of a southwest themed brunch alongside jalapeño baked mac n’ cheese, avocado corn salad, winter fruit salad, and black bean and corn quesadillas. Preheat oven to 350°F. 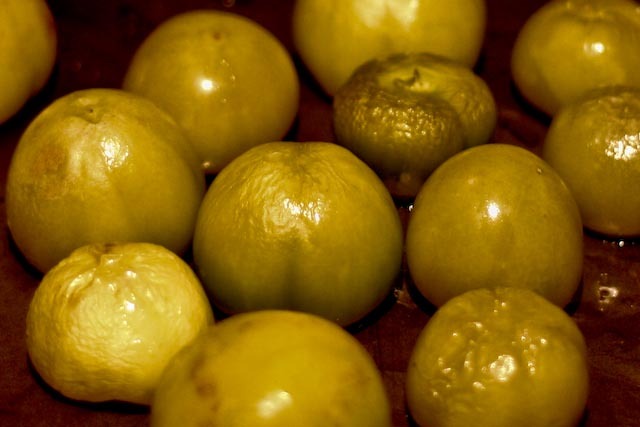 Peel the outer paper skins of the tomatillos, place them on a baking sheet and drizzle with olive oil. 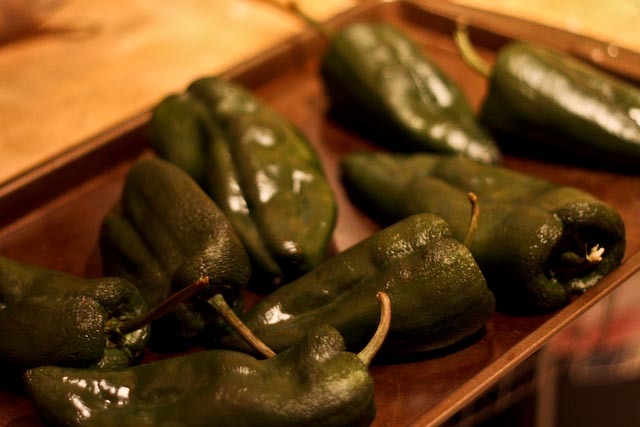 Also place the poblano peppers on a baking sheet and bake the peppers and tomatillos for about 20 minutes, until they are soft and the peppers are just charred. 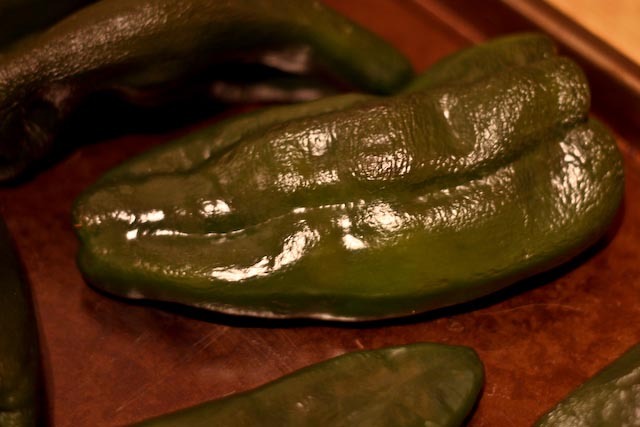 Remove the pans from the oven and place the poblanos in a plastic bag to steam for about 5-10 minutes. 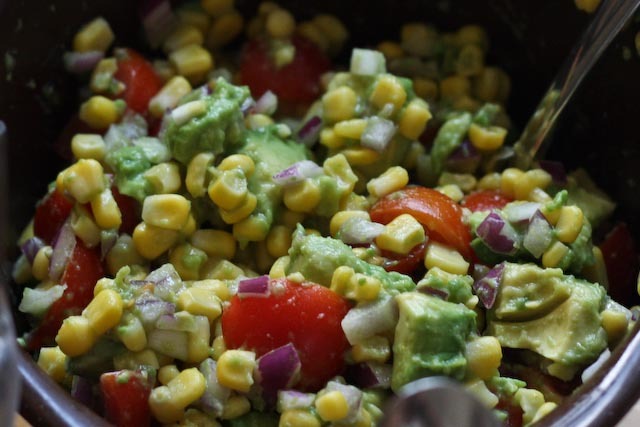 Meanwhile, in a saute pan over medium heat, add a few tablespoons of olive oil and cook the onion, garlic and jalapeños for about 10 minutes, stirring often, until they are just cooked. Remove from heat and set aside. 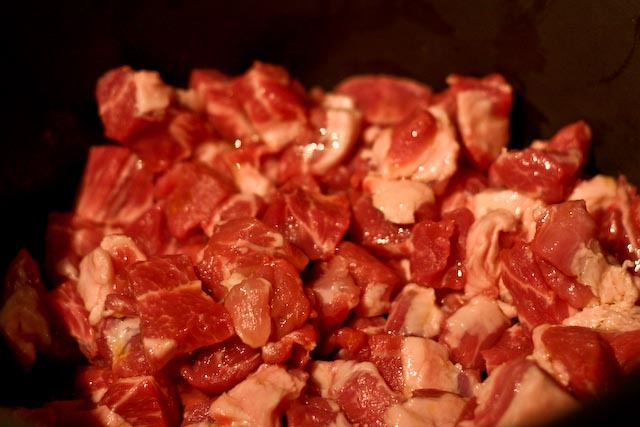 Place the cubed pork shoulder in a heavy bottomed pot and drizzle with olive oil. Sear on high heat until all sides are brown and deglaze with chicken broth. 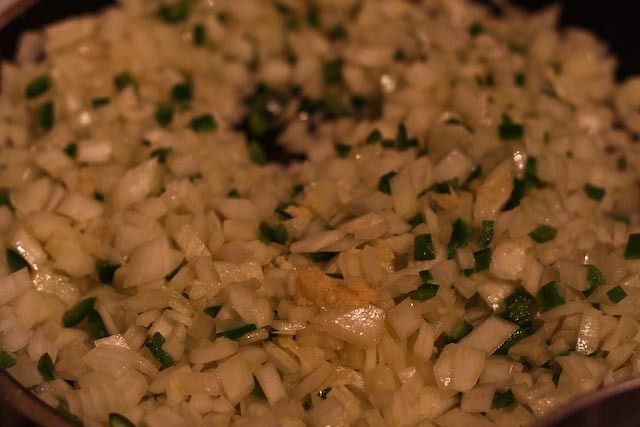 Add the sauteed onions, garlic and jalapeños. Lower the heat and let simmer for about 10 minutes. 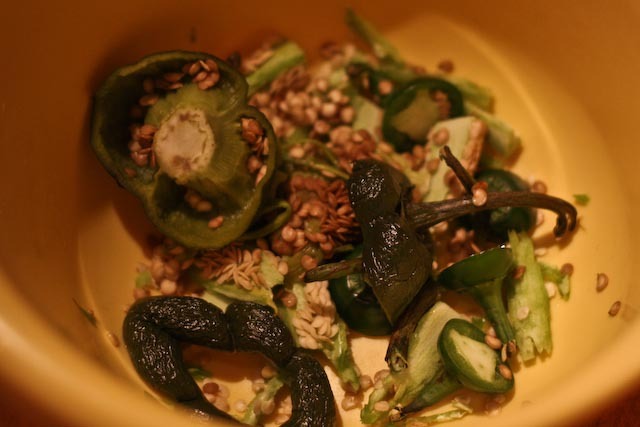 Remove the poblanos from the plastic bag and peel (as best you can) and seed the peppers. 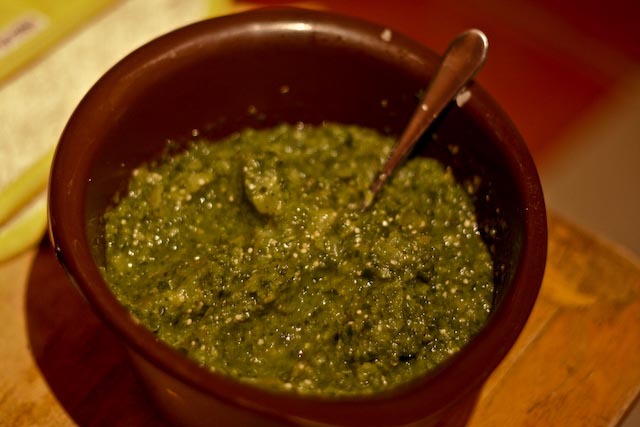 Puree the poblanos and tomatillos in a food processor until well blended. 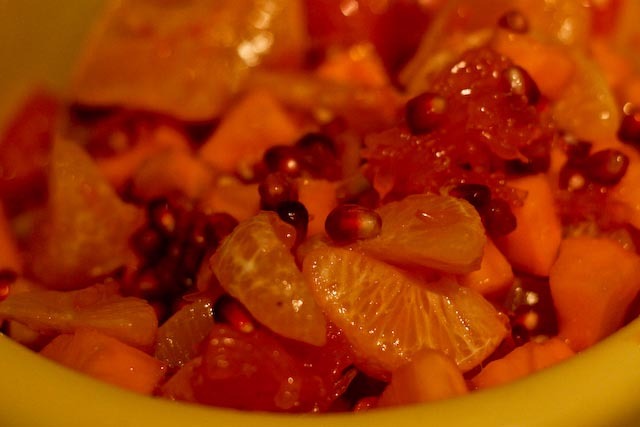 Add the pureed mixture to the pot, stir well, and continue to simmer. 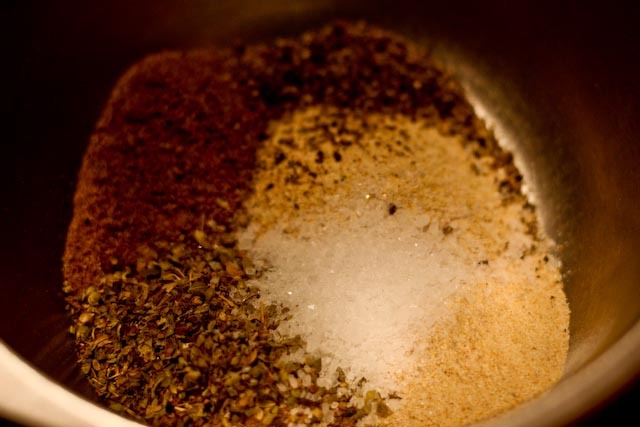 Combine the garlic powder, black pepper, salt, cumin, oregano, and coriander in a bowl and then add the spices to the pot and stir well. Let the chili simmer on medium-low heat, stirring occasionally, for about 1 1/2 to 2 hours or until the pork is nice and tender. In a small saucepan, mix about 1/2 c olive oil (or butter) with the corn flour and stir over medium heat for about 2 minutes to make a thickened masa roux. Add the roux to the chili and stir well. [Note: if the chili is too spicy, make another masa roux and add it to the chili to reduce the heat of the peppers]. Let the chili simmer for 10 more minutes and serve warm. I really like that one. Keep up the good work on your blog.